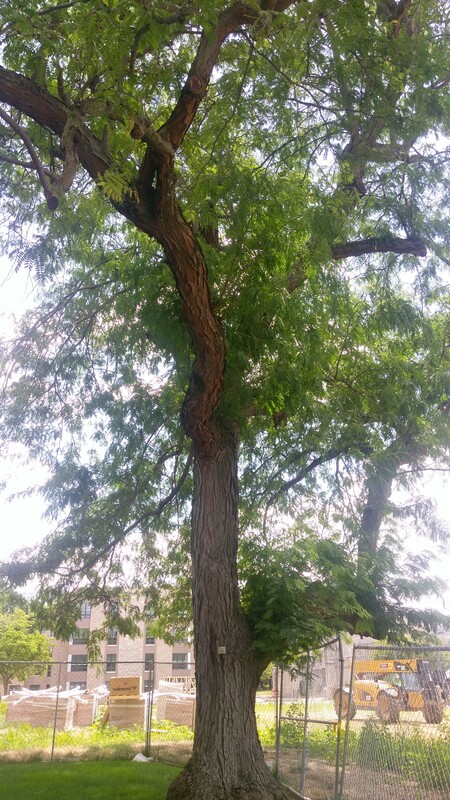 A Honey Locust tree which stands to the southwest of Irwin Library at Butler University. 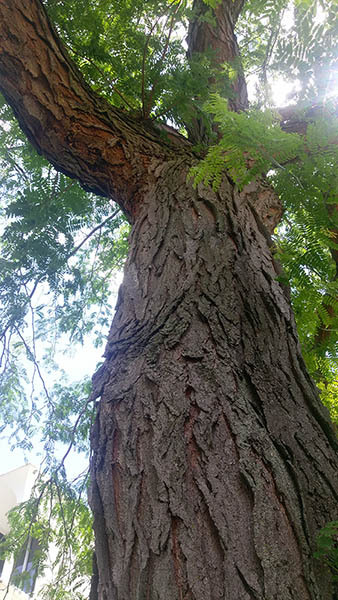 According to the Friesner Herbarium at Butler University, the Honey Locust is "native. Although identifiable in the wild by sharp, smooth, branched thorns on its trunk and branches, some commercial varieties are thornless. Leaves are arranged alternately and are once-or-twice-pinnately compound. The fruit is a long, flattened, corkscrew twisting, dark brown pod (up to eight inches) containing sweet, honey-like pulp eagerly eaten by cattle, deer, and other mammals. 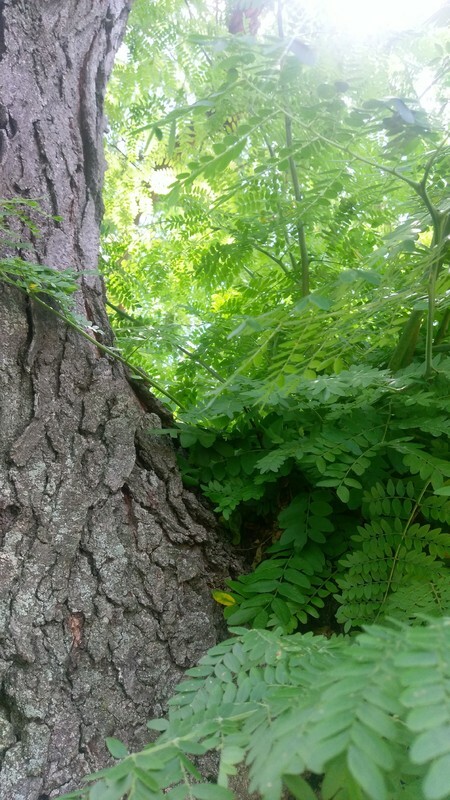 Highly adaptable and tolerant of drought conditions, this tree has encroached as a pasture weed in some areas." Copyright Butler University Libraries, all rights reserved. This material is the property of Butler University Libraries and Butler University Archives. Material can be downloaded for educational, personal use only. Any duplication, distribution, or reproduction of this material for commercial or non-commercial use without the explicit permission of Butler University Libraries is expressly prohibited. 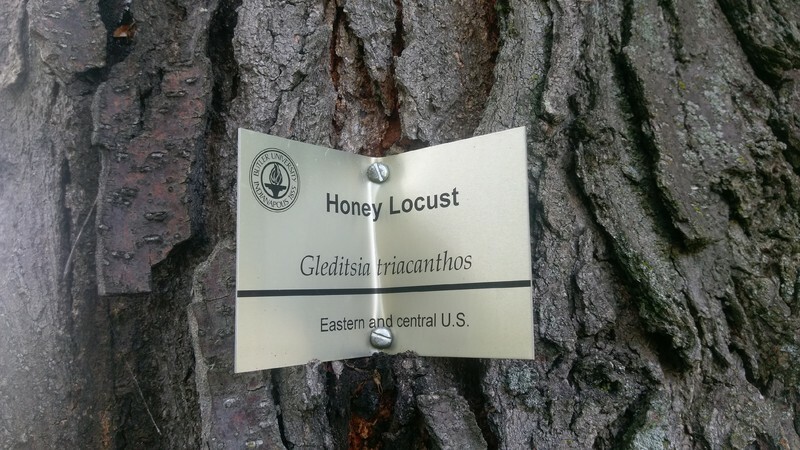 Olivia Pratt, “Honey Locust,” Butler Digital History, accessed April 26, 2019, http://digitalhistory.butlerlibraryservices.org/items/show/3659.